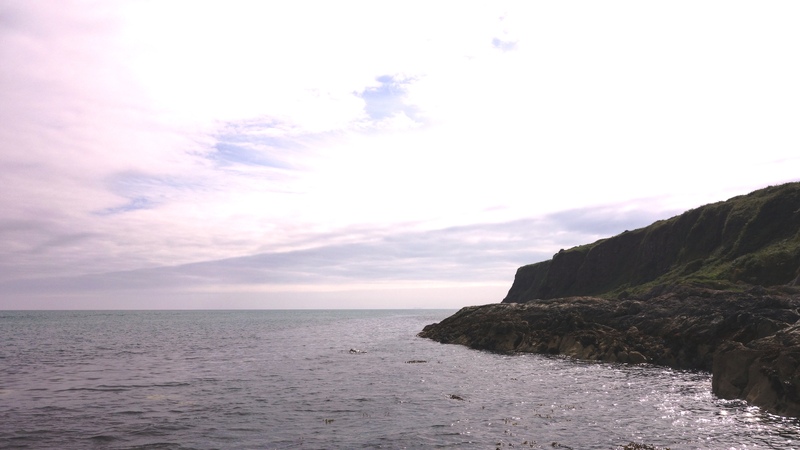 Islandmagee is a peninsula on the east coast of Co.Antrim and in many ways its often disregarded by many in Northern Ireland given that its off the beaten path. 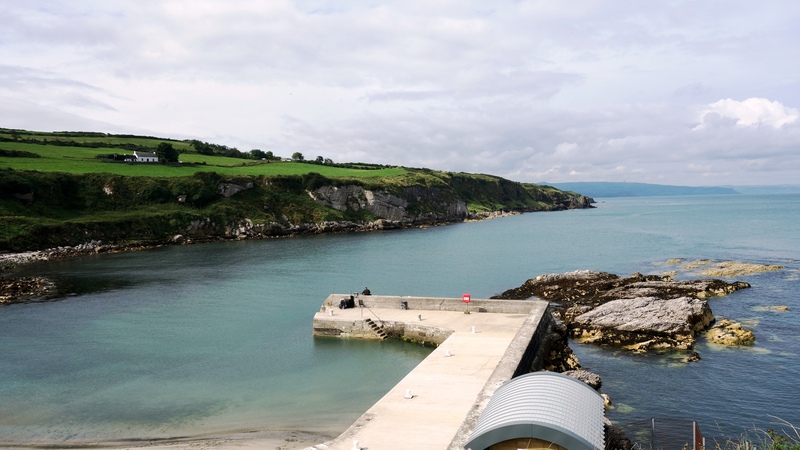 Its very much a rural community there although it does house Ballylumford power station which provides Northern Ireland with half its electricity, but hidden away at the north eastern tip of Islandmagee lies Portmuck which really is worth a visit. 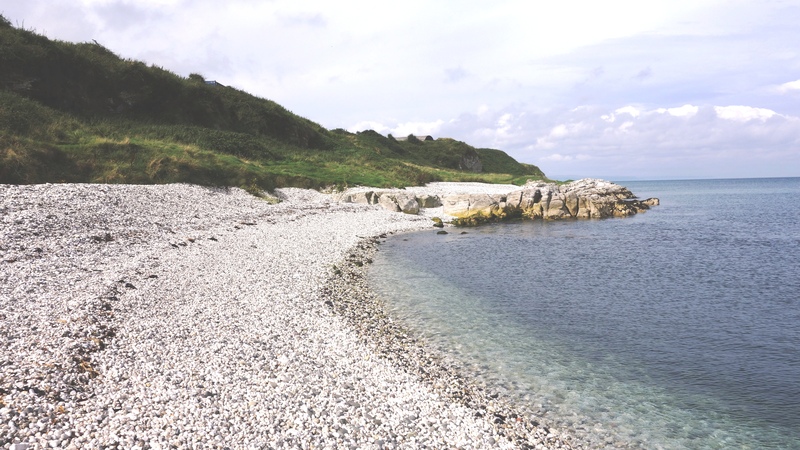 Portmuck doesn’t get its name from its hygienic condition, but rather from the old Irish word for pig which was “muc” therefore the label actually means harbour of pigs. 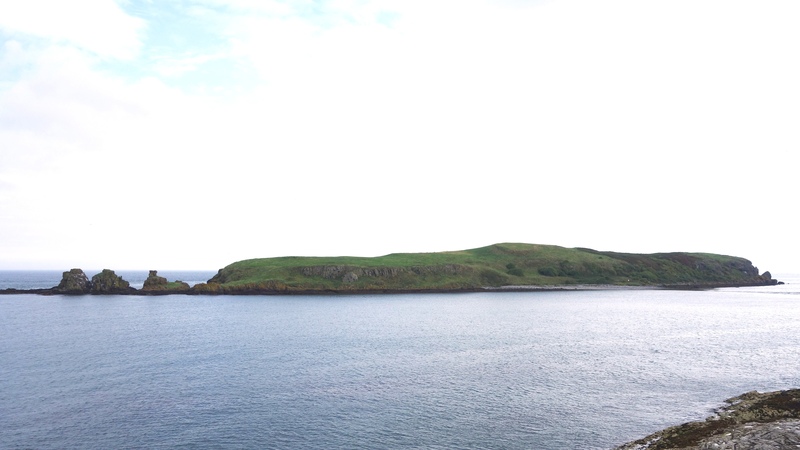 A long time ago the area had a roaring trade in cattle, horses, and pigs so it looks like the swine managed to give the place its name (though some say its because the island off shore here looks like a sleeping pig but its open to question). The island is known simply as The Isle of Muck (lol) which was once a hiding place for horses when they were being smuggled across from Scotland by those wishing to avoid excise or having them taken away. It was also a retreat for a few scamps on the run from the law. 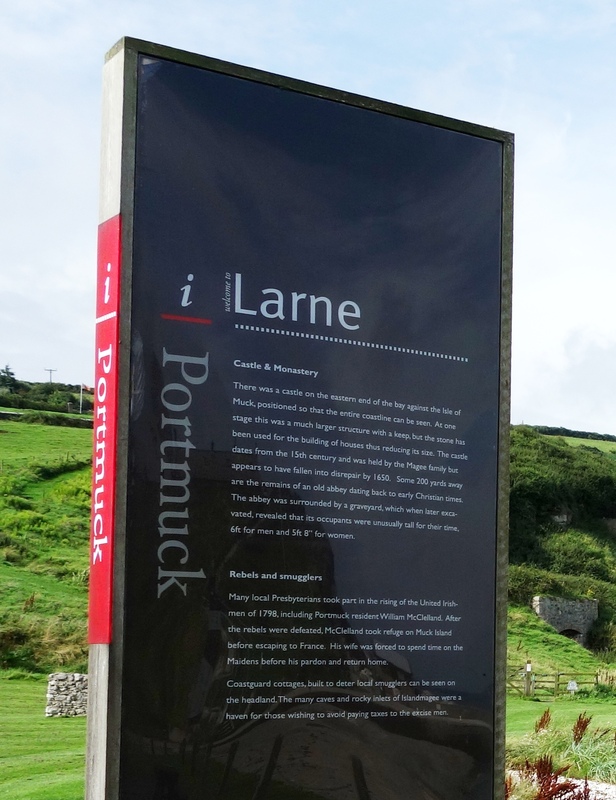 Some information you will see on arriving at the car park in Portmuck. You can read some notes about the history of the place and there are toilets and useful picnic benches nearby. 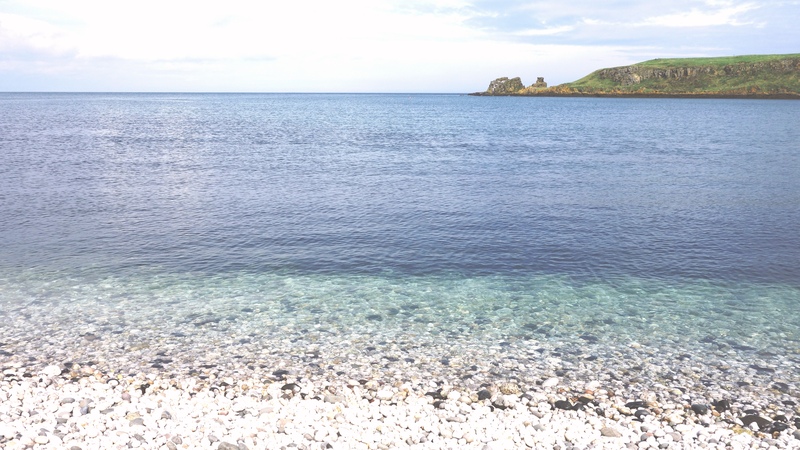 The little beach at Portmuck and a view taken from the right side hill looking down on the harbour. Really very tranquil and peaceful. From the hill top overlooking Portmuck bay you can see The Isle of Muck (not to be confused with an island of the same name in Scotland) which today provides the third largest nature reserve for birds in Northern Ireland including kittiwake, guillemot, fulmar and razorbill with peregrine falcons commonly hunting over the island. You can catch sight of puffins, otters, common and grey seals and porpoises offshore too. The only way on to the island is by approaching from the land facing side (seen here). From the hill top you should see some wooden steps to take you down to the rocks below. I highly recommend you go down. Once there, walk right along the shore until you come to this beautiful white stoned beach. The water is stunningly clear as you look across to the island. 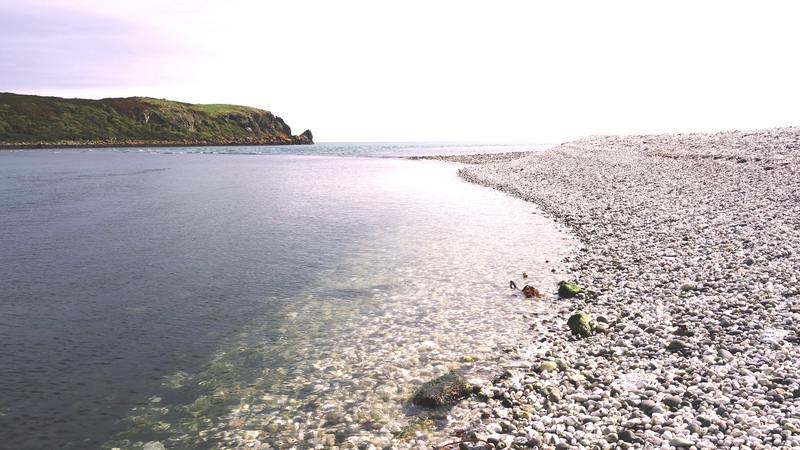 The limestone beach in bright sunlight really glows and the camera probably hasn’t done it justice here. You might be able to see a line in the water cutting across to the island which is actually a causeway that can be used to walk over at very low tide. I don’t know anyone who’s done it but the old picture here (not mine) clearly shows that its possible when the tide drops low enough: https://i.imgsafe.org/1452c6cf49.jpg its also said that livestock (many years ago) where brought to and from the island this way. I have to say however, I think it looks a lot more beautiful when the causeway is covered by the sea. The edge of the causeway. Just beyond the beach lies some huge green cliffs which Ive read contains a two mouthed cave that may be accessible at low tide. Sadly this was as far as I could go today though. At the left side of the beach there’s a small gate that allows you access to walking a path high above Portmuck Bay (marked by this sign). Once at the top, the view was simply stunning…. 🙂 You can see the Portmuck island just behind the bay.